I grew up on the windswept plain of southern Idaho. I didn't learn to swim until I was twelve years old, even though I took swimming lessons for a few summers. Our city pool was demolished about that time, so our swimming options dwindled to the local lake, the YMCA (of which we weren't members), and a neighbor's private pool (where I was rarely invited). I didn't learn how to swim well until I went to college, and I still am not too swift nor too accurate, but I can get across the pool when necessary. Raising AZ kids is entirely different. Kids swim at least once a day all summer long, their bodies browning in the sun and their tongues turning blue and red from otter pops while they dry off. 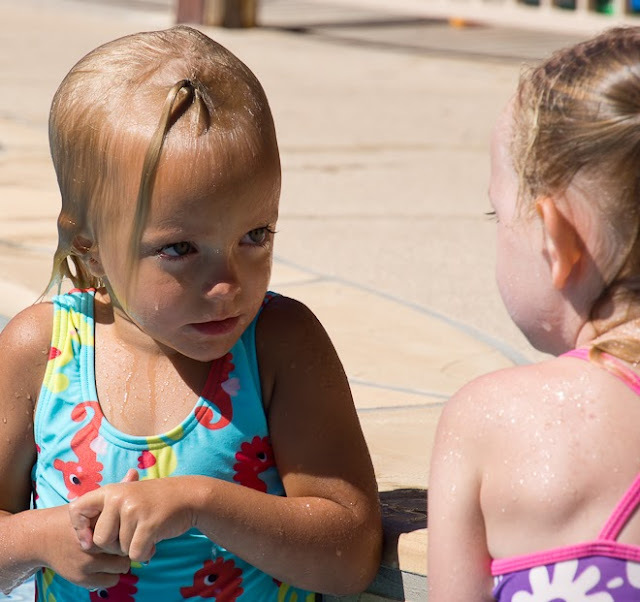 It's dangerous to not know how to swim when you are around water that often, so almost all AZ kids know how to swim before they start kindergarten, and most learn basic water survival skills between the ages of 2-4. 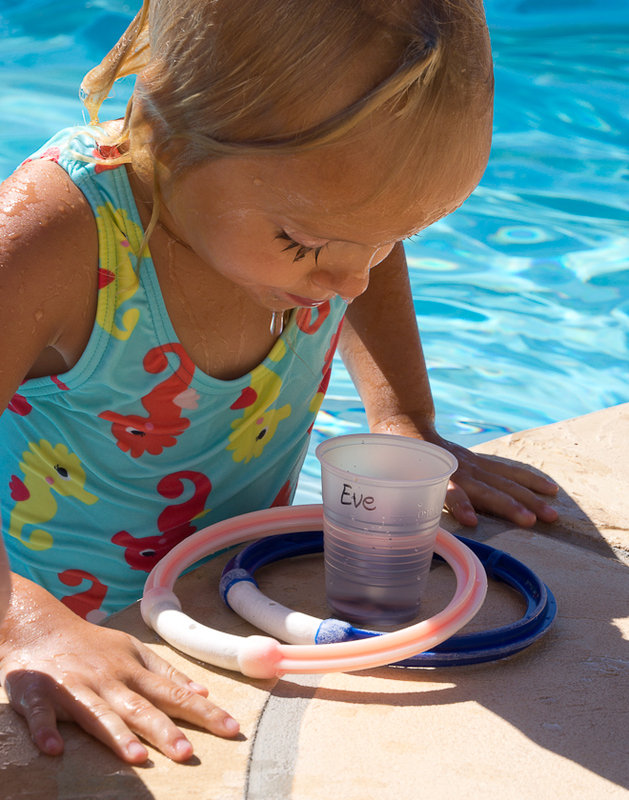 Evie is three years old--the summer to conquer her water fear. 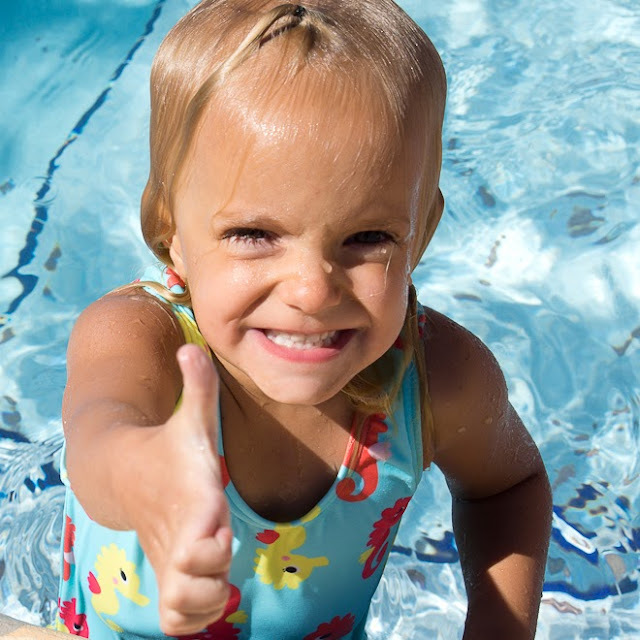 All four of my younger kids have completed swim lessons with the same teachers, so I knew what to expect. Four weeks of 30-minute lessons four times a week. I could count on crying for the first few days, but then it would turn fun. This is how Evie looked at almost every lesson, every day for four weeks. Sixteen lessons. And she cried at thirteen of them. It was hard on her, and on Miss Jodie, her teacher. I ended up leaving most days, because she would hang on the edge of the pool and cry for me to rescue her. I never did. Basic survival swimming is taught differently from swimming. 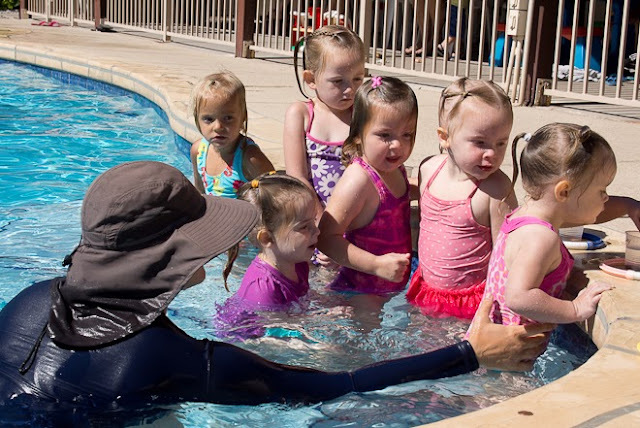 These six darling little girls were routinely dunked, thrown, knocked, pushed or tossed into the pool, then taught very carefully how to recover and get to the side. She didn't shed single tear on penny day--where they dive for pennies and then they can spend them at the makeshift snack bar run by the teacher's son. 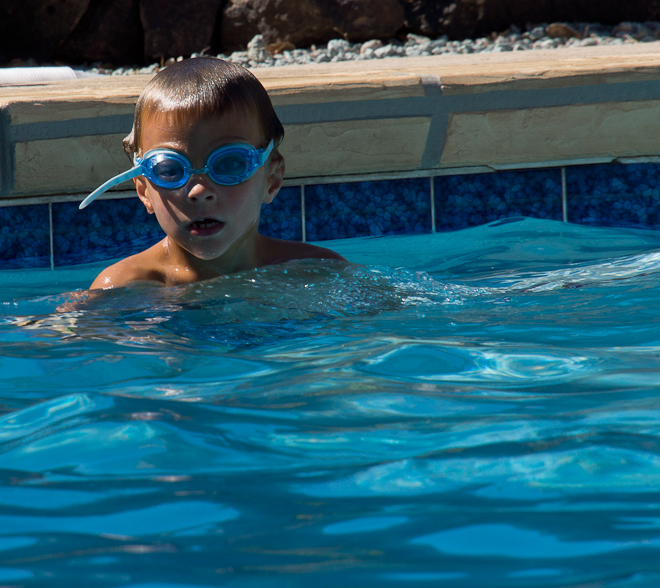 Hyrum took lessons in the same pool at the same time. He was the best swimmer in his class, and probably could have moved up a level, but his teacher was really good at adapting what they were learning to his abilities. He also loved penny day--although Mrs. K limited him to twenty pennies. Hyrum always kept Evie in sight, encouraging her and trying to help her not be scared. I love the tender spot he has in his heart for her--he's a great big brother (most of the time). I tried a "thumbs up!" signal with Evie--every time she resurfaced after struggling to the side, I would give her a thumbs up, and if she wasn't coughing or crying too hard, she would give me one back. I always laugh at how these little AZ kids shiver in the pool during lessons. The water is probably 82 degrees, the air temperature anywhere from 90-105 degrees, and yet they shiver. I am so thankful to Jodie for sticking it out with Evie this summer. Just last week she jumped off our diving board all by herself and swam to the side. All the tears and fights were worth it. Evie can swim. And I can breathe a little easier in the pool. Another little fish in your family! Good for you - I am in complete agreement with you - swimming is an essential life-skill. My two wee grandsons are in swimming lessons this summer, in Alberta, where the air and water aren't so warm. I don't know how they do it! I was a lifeguard through high school and university, and that's how I met The Great Dane! You can't beat AZ swim lessons. 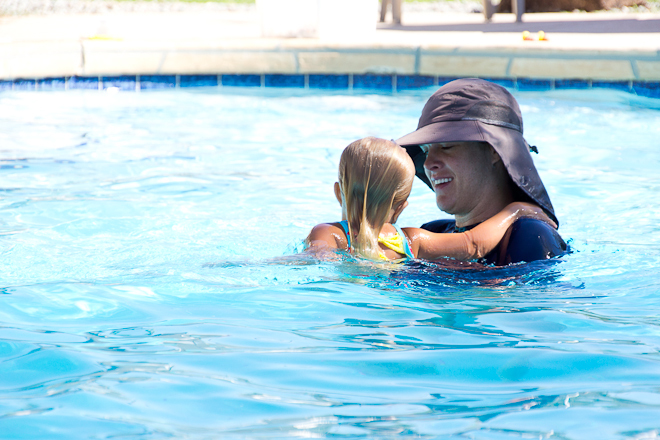 I had two kids when we lived there and by by 2 1/2 years old and 8 sessions, my kids could swim. Really swim. We don't have lessons like that here. 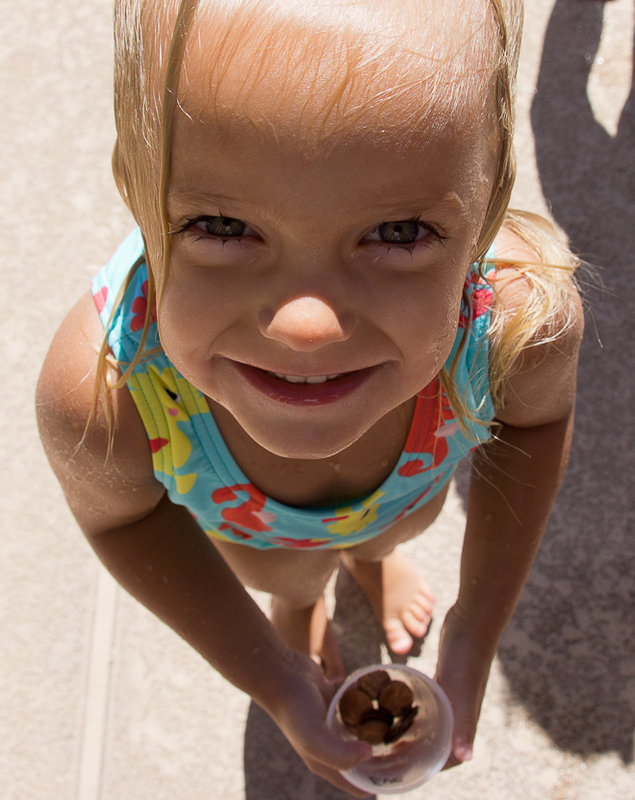 I wish we did. .
Oh yea, our Arizona summers spent in the pool...sometimes twice or three times a day. 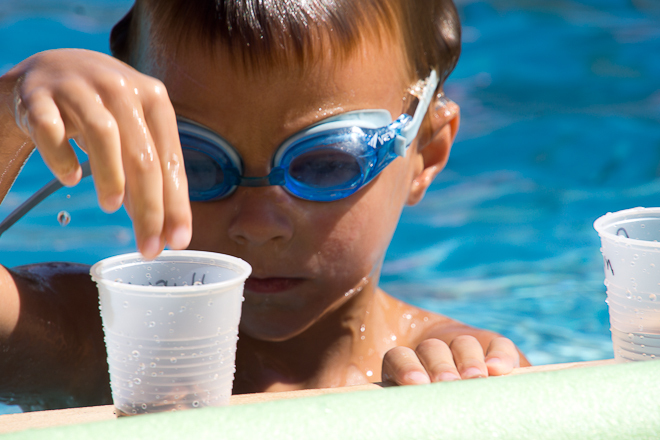 Our kids learned to swim without floaties by age 3...it was a necessity, like you said. And they turned into little brown berries too. Congratulations to Evie and Hyrum! Catching up over here....we've been away and I completely forgot about checking in the last two Mondays. :( Not that it would mater! We're back on the saddle this week. I love Evie's thumbs up picture. Your pictures just keep getting better and better Jenny! I lived at the pool during the summer...it was across the street from my house. Oh, how I would love one in our backyard! Way to go Evie!! Isn't it amazing that the last one still keeps you on your toes!! Glad she is taking swim lessons. It is so important. My 14 year old son just had to be rescued by lifeguards. It could have been a tragic situation for our family. No, my 14 year old doesn't know how to swim. This latest fiasco just bought him swim lessons too. Buck up Evie. love that penny idea. we added three extra lessons of swimming after we got home from vacation. i've been struggling to be movtivated to get us there. august is always a hard month for me to stay motivated. i want a routine, but i don't. my kids definitely live at the pool twice a week during the summer, and i love it.